The River Cray rises in Orpington and flows north east, eventually joining with the River Darent and flowing into the Thames. Because much early settlement took place in the river valley, the term ‘Cray Valley’ or ‘Upper Cray Valley’ is sometimes used to refer to the area of early settlement area around Orpington. The earliest remains of human activity in the Orpington area (the Upper Cray Valley) come from the Palaeolithic period. People at this time lived in small groups hunting mammals, fish and birds for food and skins; their diet would also have contained a variety of edible plants, fruits, nuts and berries. Tools and weapons were produced from wood, bone and antler as well as stone and flint. The only evidence we have of their occupation of this area are a few flint hand axes which have been found at Chelsfield, Green Street Green and Ramsden. Skeletal remains of extinct animals such as mammoth and hippopotamus have been found at Green Street Green. The Mesolithic people were hunter-gatherers and new types of tools and weapons were introduced: small flint blades (microliths) for mounting in pieces of wood as harpoons and arrows, gravers for working bone and wood as well as scrapers, picks and axes. All of these types of tools have been found throughout the River Cray Valley at Crockenhill, Ruxley, Orpington and Farnborough. An excavation in the Priory Gardens, Orpington, found over 3350 individual pieces of flint, a high percentage of which were worked. (See ODAS publication). About 4,50O BC small groups of settlers started to arrive in Britain from the continent introducing a new way of life which was to have a dramatic and lasting effect on the landscape of Britain. These people were farmers and they brought with them domesticated animals and plants. They cleared the forest with flint and stone axes and by fire so that they could sow wheat and barley and graze their cattle, sheep and pigs. Bows and arrows continued to be used for hunting and warfare. They also introduced the making of pottery to Britain. Evidence for these first farmers in the Orpington area (Upper Cray Valley) is restricted to flints and stone tools. These stone tools have been found along of the River Cray from St Paul’s Cray to Orpington, Green Street Green and Farnborough. During this period a mixed farming economy continued to be practised and there is evidence that ownership of land was being regularised, and formal land boundaries constructed. Farmsteads began to appear. New types of British pottery were produced and others called Beakers were introduced from the Netherlands and the Rhineland. A fragment of a beaker has been found in St Mary Cray and a flat Bronze axe was found at Petts Wood. New centres of production and distribution based on new types of bronze metalwork sprang up and increased quantities of metalwork with new types of tools and weapons became available. Towards the end of this period some parts of southern England were reorganised into larger areas within massive formal boundaries, suggesting that ownership of land was in the hands of a small number of individuals or influential communities. Although no evidence of any settlement has been found in the Orpington Area quantities of flint and bronze tools, together with pottery from this period have been found throughout the Upper River Cray Valley. Agriculture continued to form the basis of life. Small farmsteads existed widely over the country and with the expanding population there was pressure on good agricultural land which caused social unrest. To protect themselves the Iron Age chieftains constructed hill forts where people could shelter with their animals or possibly store grain and other goods to trade with. Iron became readily available and was used for making tools and weapons. Towns began to develop in South-East Britain and there was an increase in specialisation with people becoming potters, carpenters and smiths, for example, and coins began to be made. At Holwood, Keston, there is a massive Iron Age hill fort. Ditches, pottery and coins from this period have also been found from Ruxley, St Mary Cray through to Farnborough. When the Romans conquered lowland Britain they brought with them the knowledge of road building which meant that the army could move around quickly. New towns were built and trade rapidly increased. London became the capital of Roman Britain and developed as a port where goods, such as wine, olive oil for cooking and lamp fuel, brooches and even millstones, were imported and exported in a way that Britain had never seen before. In the countryside wealthy landowners built villas, large buildings made of local flint and tile with tiled roofs, under floor heating and mosaic floors. A number of Roman settlements (including villas) exist in the area at St. Pauls Cray, Fordcroft (A Roman Bathhouse occasionally open to the public), Orpington (Crofton Roman Villa open at certain times) and Ramsden. At St. Mary Cray a corn drier and trackway have been excavated by ODAS. A large number of Roman artefacts have been found in the Orpington area consisting of, for example, pottery, lamps, coins, brooches, rings, keys and glass. The pottery was both locally made as well as being brought in from places such as Colchester and imported from Gaul (France). As the Roman Government and the army withdrew, money ceased to reach the country and fell out of circulation, this put an end to the production of goods which depended on coinage for their purchase. By the second half of the 5th century the Roman way of life was changing as new people called Angles and Saxons settled in Britain. Life became centred on small agricultural settlements of timber framed hall houses with associated huts. ODAS has excavated one of these huts in St Mary Cray and on the other side of the river Cray there is an Anglo-Saxon cemetery at Fordcroft. 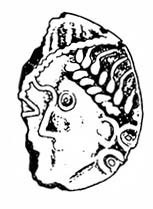 There are also several Anglo-Saxon charters which mention places in the River Cray/Orpington area, namely:- Craeges aewhna (source of the Cray), Chislehurst, Crofton and Orpington. Most of the population continued to live in the countryside, in small settlements consisting of timber-framed houses. Manorial estates were an important feature whether owned by a noble landowner or by the church. Many parish churches made of wood were replaced by stone ones. The Domesday survey of 1086 lists settlements at Ruxley, (St Pauls) Cray, Orpington, Crofton, Chelsfield, South Cray and Sentlinge (St Mary Cray). The Priory at Orpington was a manor of the Priory of Christ Church at Canterbury and also served as the rectory. An excavation by ODAS at Scadbury Moated Manor has revealed occupation on the site dating back to the early 13th century. During the Medieval period most of the Orpington/ River Cray Valley was either farmed or was left as woodland with manor houses and farm houses situated along virtually the whole of its length. Towns expanded as manufacturing industries produced more goods which were traded around the country and abroad. To cope with this increase in demand the population in the towns increased and more food was produced. Most of the fruit for the London market came from Kent for example. Although no new major buildings were erected in the Orpington area during this period the villages already in existence expanded as the population increased. 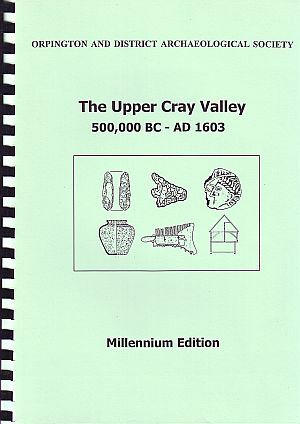 The Upper Cray Valley Project is a survey carried out by ODAS (in conjunction with local museums) of archaeological finds in the Upper Cray Valley area.Further details of the finds and settlements recorded in the Upper Cray Valley are contained in a series of publications produced for the different periods by ODAS. The published results are available to the public in several separate volumes – see publications page for details. The project has also been published as a one-volume Millenium Edition. The publication records activity in the area from pre-historic to early modern times (500,00BC – AD 1603). In the map below, the river Cray begins at Orpington and flows north-eastward through a lowland area (the River Cray Valley). The area around the river’s source in Orpington is the upper Cray valley.